I've always believed that sharing the "why" is as important as the "what" so in addition to outlining the changes, I also want to share background information that helped inform our decision to makes these changes. Eliminated. Zilch. Zero. Nothing. No. More. Physics. I know many are happy to hear this. It seems to be the one subject that causes much rumbling. Not surprisingly, even the strongest of science students tend to struggle a bit with physics. 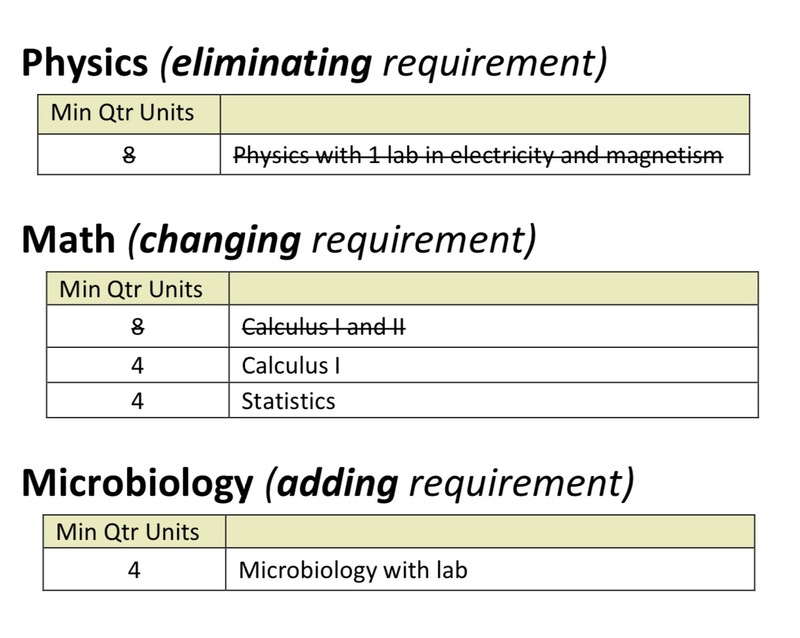 Background: The specific concepts of physics are not anticipated for future curriculum content. When and should these concepts arise, they can be addressed within the curriculum as part of introductory or preparation sessions. 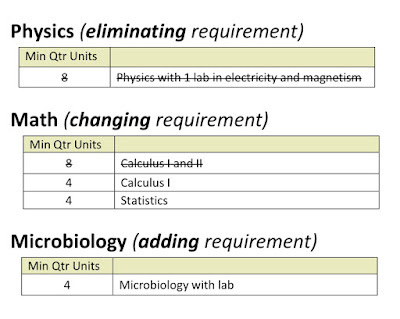 We now require microbiology with lab. This shouldn't cause too much alarm since many schools require this -- and MOST of our applicants and admitted students complete this subject anyway. Background: Infectious disease therapeutics has become an educational cornerstone to all practicing pharmacists. Whether in the retail, institutional, industry, or research arena, a mastery of the prevention and treatment of infectious diseases by pharmacists remains paramount. Given the extraordinary role that pharmacists play within the discipline of infectious diseases, students should now enter the PharmD program with prior exposure to basic microbiological principles. The ACPE standards also highly encourage this biomedical science subject be addressed in the pre-professional curriculum as a requirement for admission into a PharmD program. Previously, we required Calculus I and Calculus II. We now require only Calculus I but have replaced Calculus II with Statistics. This should be welcome relief for those who aren't to fond of calculus. Background: Pharmacists are amongst the many health professionals and scientists expected to evaluate issues in medical and biological sciences that are addressed by collecting and exploring relevant data. The application of this population-based information to decision making regarding individual patient care requires biostatistics, a content area consistently taught throughout the PharmD program and required by ACPE as an element of the core curriculum. Therefore, a fundamental understanding of basic statistics is required so that successful competency of biostatistics can be achieved by our students. Our current brochure has been updated to reflect these prerequisite changes but we're aware many previous documents (and Course Prerequisite Agreements) don't reflect the updates. For more information on all our subject area requirements, please visit our Academic Prerequisites page.